Guess Who Has Double Eyelids Now? Anyone who knows me would know how badly I wanted double eyelids. For all my life, I was bothered by my single eyelid; not that they were ugly, but I knew I didn't want to live with them forever. Having double eyelids was a lifelong dream. 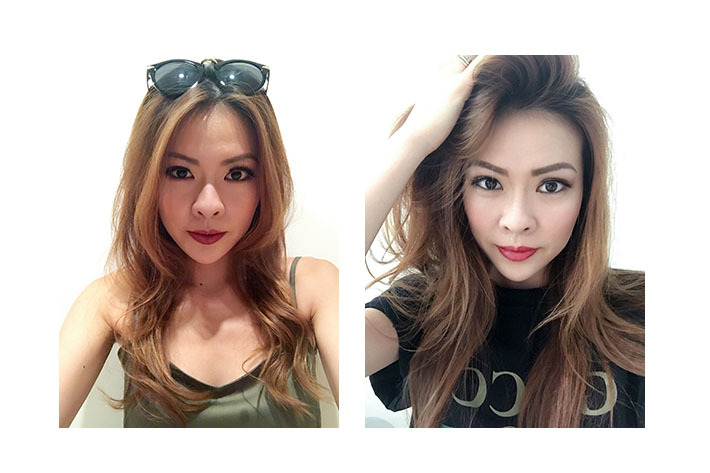 I was in Dance all my school life—from primary school to secondary school—and it was at that young age that I started applying makeup. I always resented the fact that my makeup just wouldn't come out as pretty as the other girls'. Fast forward a decade and I worked part-time selling cosmetics while waiting for my GCE O'Levels results. I was exposed to a lot more cosmetics, I went for training on how to do a proper makeup, but no matter how "proper", there was always something missing. And I can't believe I lived with that "something missing" for another decade. People often talk about how my eyes looked fine, I looked gorgeous in my own ways... but that wasn't what I wanted. Having single eyelid means no matter how much effort I put into drawing my eyeliner, only the wing would be visible. It also means no matter how many eyeshadow colours I blend with the best brushes, I can never make my eyes pop. If you are looking at cutting, the prices start from S$5,000. Let's start with 'type'. 'Tapered' is the most common one, with the lids going inwards the inner eye, forming a crescent shape of sort. 'Parallel' is, well, simply parallel without that curving in the inner eye & is most suited for girls who apply heavy makeup and/or wear iris lens. As for the height, it is pretty self-explanatory. I chose medium-to-high because 'low' is too natural for my liking. If you still do not understand any of the above, you don't have to worry. Dr Samuel will patiently show you the difference between the various lids. He will also do a simulation during the consultation to help you decide better which suits you better. Of course, that is when his professional opinion comes in too & they matter if you are completely indecisive/ clueless. Just trust him, really. Like I did. My surgery date was set for 21 July 2017. Everyone who goes through this surgery has to fast 2 hours before; drinking water is not allowed as well. I was advised to shower before going because it is not advisable to shower on the first day of surgery lest the water gets into the wound. I had to go barefaced too (but of course, right?). So, there really is nothing much you have to "prep" pre-surgery. You just have to go with anticipation & a composed mind. There will be another consultation with Dr Samuel on the surgery day. It is really a session to reaffirm your choice. And if you decide on something else, Dr Samuel will do another simulation & he will only proceed with the surgery after you are very certain of the type of lids you want. Believe it or not, I didn't feel a thing throughout. I was sedated; I was given a jab the minute I got into the surgery theatre & I fell asleep within 5 minutes. 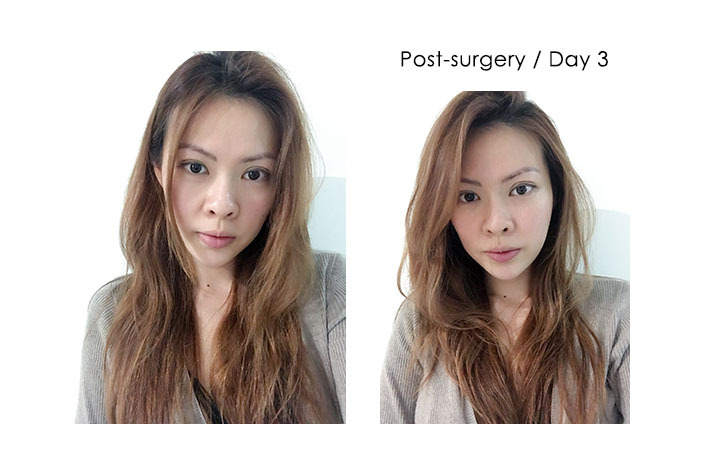 When I woke up, I was already in the recovery room—with zero pain. Yes, zero. I've heard horror stories about how some surgeons keep you awake & you could actually see them poking your eyes/ smell the burning smell from the equipment. Thank God I experienced none of that; I'd very much prefer to be put to sleep & not witness what went on during the 30-minute procedure. The pain only kicked in after my sedation wore off, and even then, it didn't last for very long. Just a couple of hours of me feeling sore, like someone just punched me in the eyes. Honestly? Very bearable pain. I iced my eyes every so often on Days 1 & 2; that reduced the discomfort significantly. 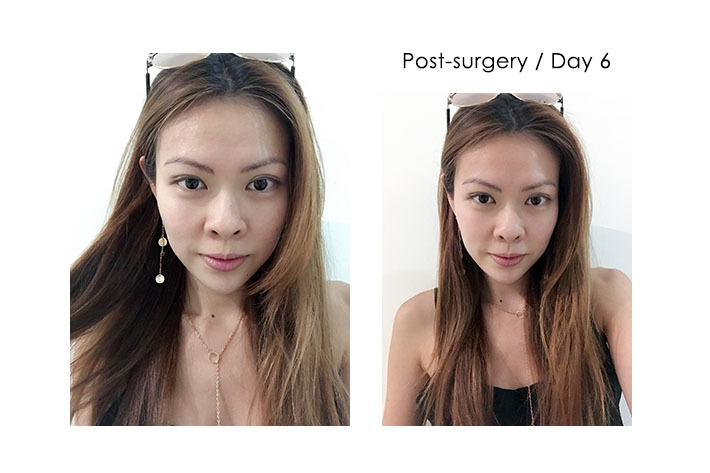 To help with de-swelling, I bought a special medicine for S$100. It supposedly helps to speed up the recovery process a lot & to boost the de-swelling speed. Best S$100 spent, perhaps. Pineapples were my best friend for the entire week. Said to contain 'bromelain' that helps deswelling, I ate fresh pineapples every day for one week. 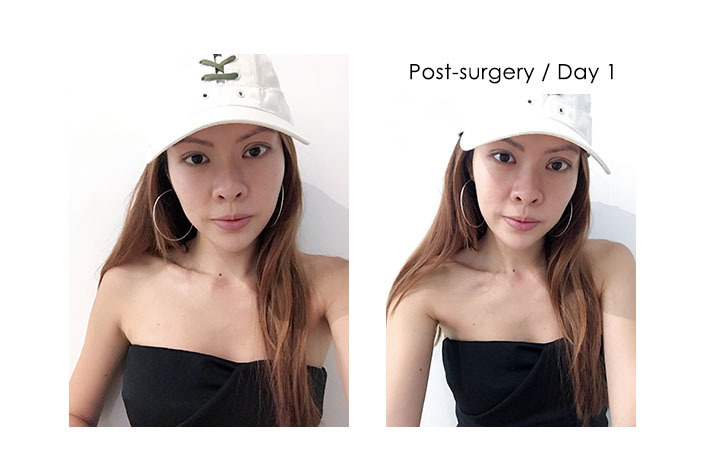 These were taken 2-3 hours after the surgery. As you can see, the right eye was pretty swollen. The uneven-ness was normal, Dr Samuel assured me. He said the usual down time is 3-5 days & that the swell will gradually go down. One day after my surgery & I went to town like that. The right eye was still swollen but it was a lot better. By the third day, the swell went down significantly. I guess the pineapples & extra medicine helped! So, Day 4 was looking a lot like the end result already. The right eye was pretty much healed & the swell was insignificant. This was also the day I stopped taking the painkillers though I was prescribed almost a week's worth of them. Day 5 wasn't too much of a difference. I could step out of the house without shades! Well supposedly, one can already apply makeup by Day 6, but I didn't. I took these pictures before going back to Dr Samuel for my one-week-post-op review. 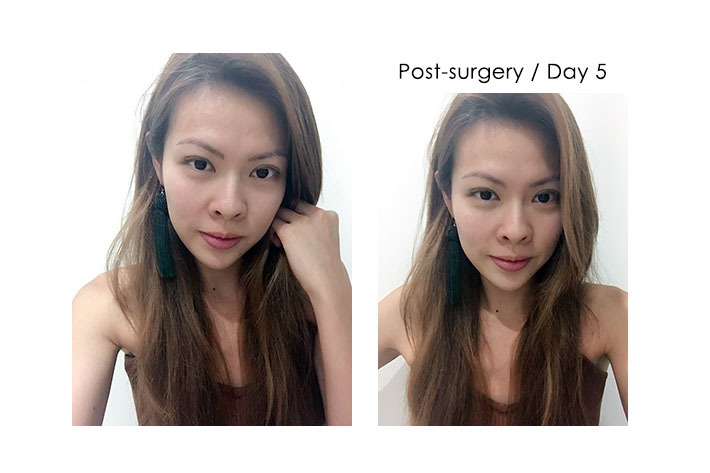 The swell has completely gone down & Dr Samuel gave me the green light to apply makeup! Now, you would probably have seen pictures of me with makeup with my new double eyelids on Instagram. I had waited all my life for this moment & I couldn't help but shamelessly spam my Instagram with pictures & videos of my double eyelids; it was like being granted a new lease of life, and makeup will be so much more fun moving forward! 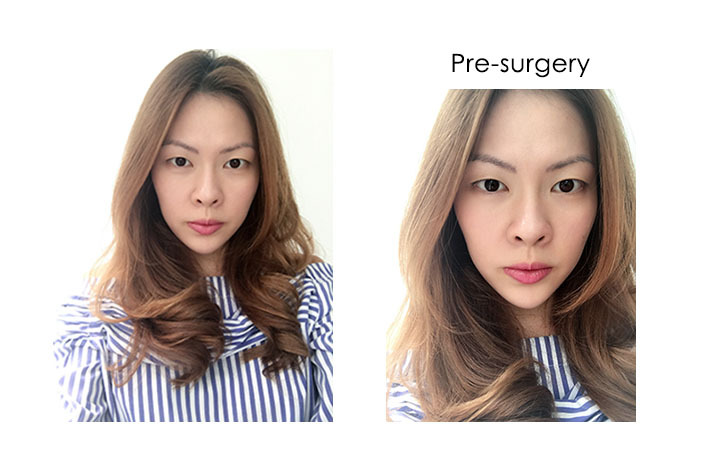 Although I opted for a medium-to-high height, the double eyelids turned out really natural-looking for me. Dr Samuel said this is because I have long almond-shaped eyes, so once again, this height may not be for everyone. With regards to why I chose stitching, well, I did not. Dr Samuel decided that for me. I guess that's because it is the most sensible choice for all "first-timers". 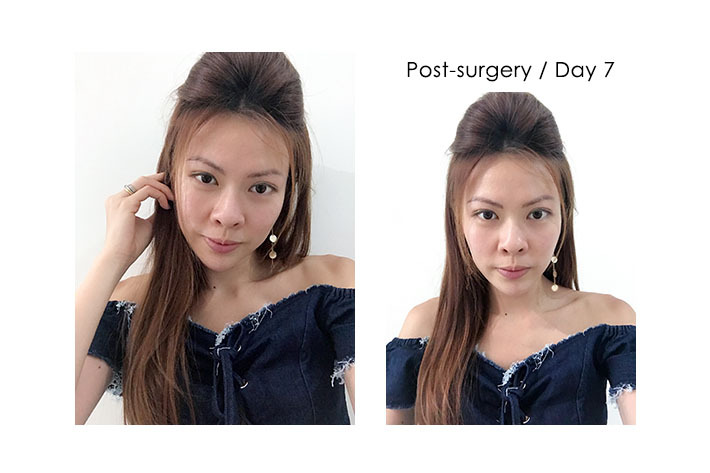 The cutting method is definitely permanent (but with a much longer down time & healing speed) but it is hardly recommended unless you have already done stitching before & it didn't last. And since we are on this, it is not true that getting double eyelids via the stitching method means the double eyelids will eventually fade away. In fact, statistics have shown that only 1 out of 10 people's double eyelids faded years after their stitching procedure. This is attributed by the fats & muscles in your eyes. Everyone's eyes' anatomy differ so if you have a friend whose double eyelids faded, it doesn't mean it would happen to you. Your best bet is to have a proper chat with your preferred surgeon. Hear what s/he has to say before you decide on either of the methods. Ok, so the debate about whether to go through a procedure to "achieve something artificial". Some of you questioned my choice of going under the knife; some tried to give me tall talks about "embracing my original beauty". But no, you are not me. You don't know how I hated my single eyelid. 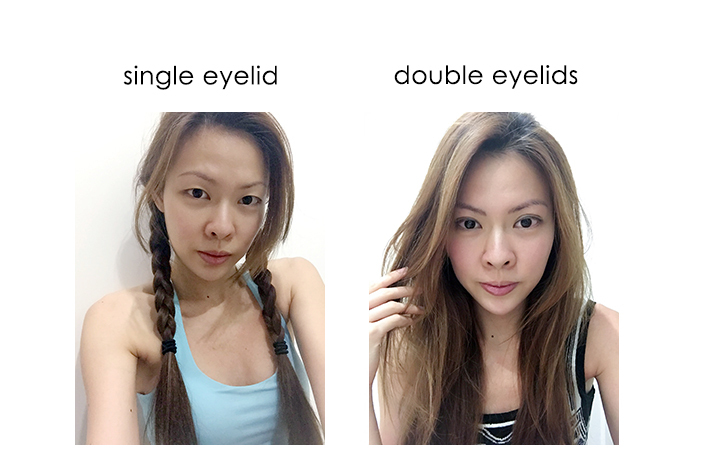 And especially if you are born with double eyelids, you will never understand how we single eyelid girls feel. And obviously, I do not agree with "natural beauty. If I know I can look better with enhancements, why not? 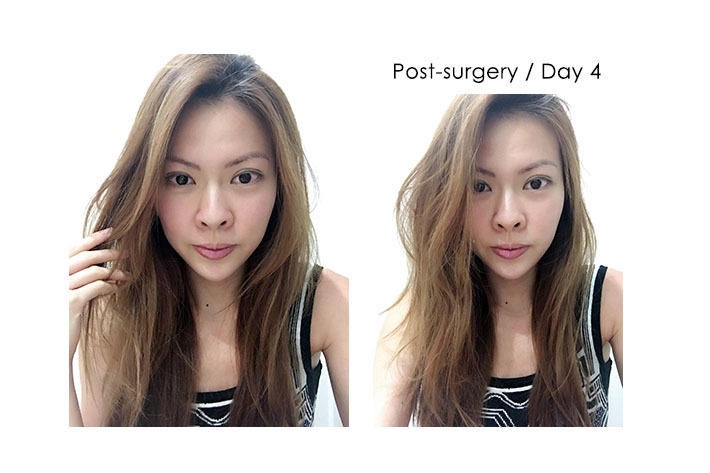 Makeup, aesthetic procedures, plastic surgery, whatever. I'll do it if it is within my means & beliefs—and if it makes me happy. We should all live for our beliefs and stop living for the expectations of society, the expectations of others. 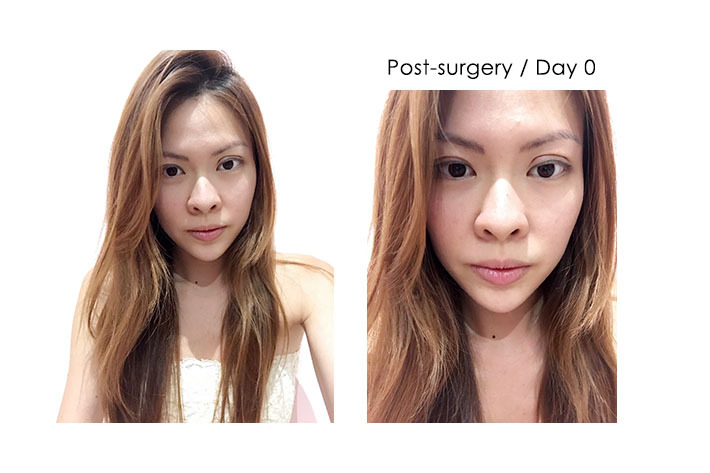 Don't worry about the stigma of plastic surgery, don't care too much about how you are "not natural". Because if you truly want to be au naturel, then don't even apply makeup; that is not natural at all! But you see, we are in control of our lives. You need not conform to society's "norms"; you decide what is best for you, even if everyone else doesn't think so. As for me, I have never once regretted this decision. Of course, I wouldn't! If any, I only wish I had plucked up the courage to do it earlier. Had I known the downtime would be so short & it would be almost painless, I would have done it after I turned legal. 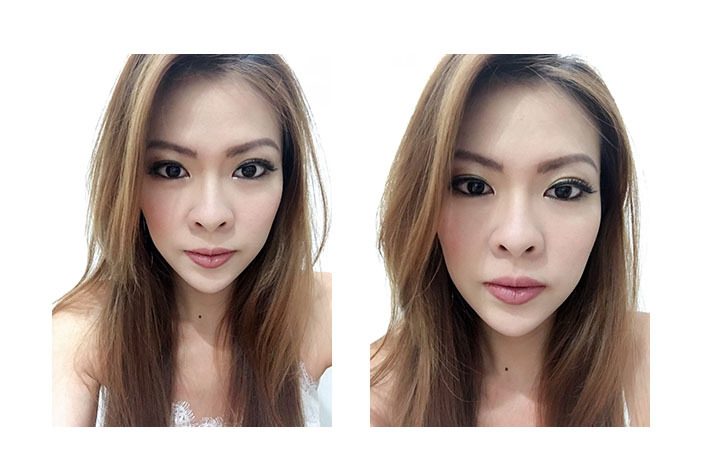 Does anyone still want to tell me I look better with single eyelid? Dr Samuel, you changed my life forever. I have never felt prettier & more confident. And I only hope more people know about you & your skills! 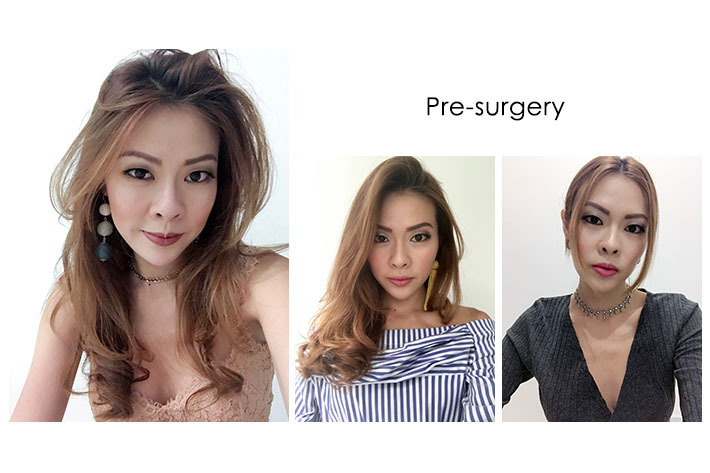 Allure Plastic Surgery Singapore is located in Wisma Atria & you may refer to their website for more information about their services.